Some professionals in the healthcare industry who work closely with electronic health records (EHR) technology argue that the increase of government involvement in health information technology, among other factors, has resulted in increased product complexity and user frustration. While it’s true that several rapid changes affecting health IT have occurred over the last decade, it’s also true that reverting to a healthcare system without standardization is not an option. The successful implementation and utilization of today’s EHRs require the help of third-party consultants who can provide immense value and best practices education by dedicating the time, resources and tools to give customers the support they need. – Ravi Ganesan, President & CEO, Core Solutions, Inc. The most common EHR love story today is a predictable one—but not in the way most EHR providers and EHR users would hope. Just like in a romantic relationship, what once seemed like perfection can reveal a few flaws up close over time. It turns out that upon the adoption and implementation of an EHR, many healthcare professionals find the features they viewed in an EHR demo are not as easy as they look in action at their organization. Users can become overwhelmed by seemingly complex features and customization options that need to be set up according to user preferences. Another essential element that adds to the difficulties of managing this complicated love story is the limited number of certified meaningful use EHR vendors. Organizations looking to implement EHRs and obtain meaningful use benefits have fewer software options available to them, which means finding an EHR that can guarantee zero frustrations throughout its product lifecycle is not a realistic expectation, especially with the new advances and changes in technology that EHRs aim to achieve. However, we can still make an effort to work toward a zero-frustration goal by discovering new ways that EHR vendors, third-party consultants, and consumers can work together to realign expectations and promote success. What are physicians and other users saying about the effectiveness of EHR systems today? Clicking more accomplishes less. Data entry takes too much time. Productivity drops before it rises. These are all valid claims but don’t reflect the kind of feedback that EHR vendors trying to make a difference in the healthcare community would like to hear. This signifies the fact that we need to work harder to address user experience concerns by getting to the root of common challenges surrounding EHRs. Struggles with effective EHR use and results are a combination of imperfect people, processes, software, and expectations. Customer needs drive successful products; only when the feedback loop between customer and vendor remains clear and continuous, can product improvements occur rapidly and meet users’ real needs. In the field of electronic health records, this process gets complex very quickly. Federal, state, county and local requirements coupled with the vendor and client goals create long lists and conflicting priorities. Standardization can override customer needs, which are often not sufficiently discussed upfront by all those involved in the creation of the EHR product. Another level of confusion comes into play when organizations shopping for an EHR see only the standardization evident in nearly all EHRs and thus overlook the unique aspects in each that may better suit their long-term needs. The feedback loop in healthcare product development is slow, broken and frequently, nonexistent. For organizations searching for their next EHR partner, there are several ways to contextualize their own needs and expectations that can lead to a more successful EHR evaluation. Long-term success can come when organizations focus on their unique internal requirements and avoid concentrating on the commoditized features present in all vendors’ products. What else goes into creating a successful implementation? The challenges that come along with EHR sales and implementation require a unique approach that puts less pressure on customers—tapping into another resource, implementation partners. These third-party consultants bring a high level of professional expertise and objectivity to the implementation process, and although customers still need to carry their weight during setup and use over time, they can better focus on meeting their own needs at every stage of the process. 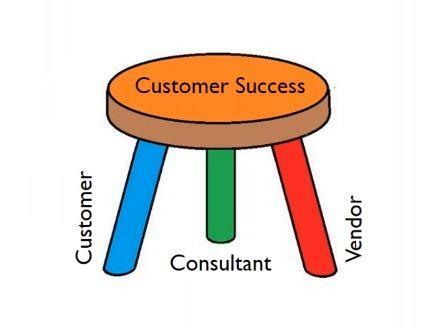 Leveraging the power of third-party consultants, the 3-Legged Stool Approach doesn’t place the entire burden of a perfect implementation on the EHR vendor. Instead, the vendor and consultant work together to support long-term customer success and requires that the customer become more involved, so this significant organizational change meets their unique internal needs. Countless internal and external factors affect the way an organization views its services, processes, and systems and can make optimizing and implementing EHR changes a challenge, especially if the organization doesn’t possess the right mindset and tools to effectively manage change. To avoid frustrations, damaged reputations and lost time and money, business leaders must learn how to put the pieces together within their own organization to encourage cleaner outcomes and adopt solutions that benefit their team and customers. While they may also apply to change management in other types of organizations, five core competencies exist that can prepare leaders and their teams for significant changes in their healthcare technology. Learning to master these elements means improving everyone’s skills at reducing confusion and anxiety, resistance to change and false starts for all changes in technology and organizational requirements that come with working in the industry. Third-party consultants are invaluable in the EHR implementation equation, helping to bridge the gap between vendor and consumer in a way that takes into consideration the intricacies of healthcare technology and the struggles of managing a healthcare organization in today’s value-based environment. As more EHR providers work with third-parties to better serve users, organizations will also improve their abilities to manage change throughout all aspects of their business. This post is part of our Guest Thought Leadership Series and is authored by the team at Core Solutions, Inc. Core Solutions aims to improve whole person care by providing digital healthcare solutions that enhance the way behavioral health organizations care for consumers. This blog is inspired by key highlights from the webinar Avoid EHR Anxiety by Focusing on a Change Management Strategy, led by Core Solutions President and CEO Ravi Ganesan and Afia Managing Partner Matt Hoffman. Give Your EHR a Boost Today!